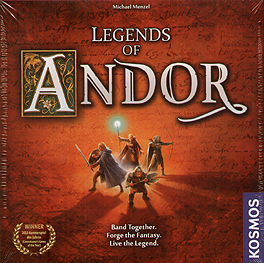 Legends of Andor is a cooperative board game for 2-4 heroes. Live the legendary tales as you unite to battle ever-encroaching enemy forces. After the first legend, more fantastic adventures ensue. You must find the witch and obtain a medicinal herb to cure the sick king. Help the prince repel the evil powers of the dark mage. In the ancient mines, you seek out precious gemstones - and uncover grave dangers. And finally. you must pit your skills against the mighty dragon, awakened from an age-old slumber, Can you triumph against these challenges? Only if you work together will you have the strength to be the true heroes of Andor.